EuroPalestine and others marched through the streets of Paris on 8 March, International Women’s Day, to demand freedom for Palestinian women prisoners in Israeli prisons. 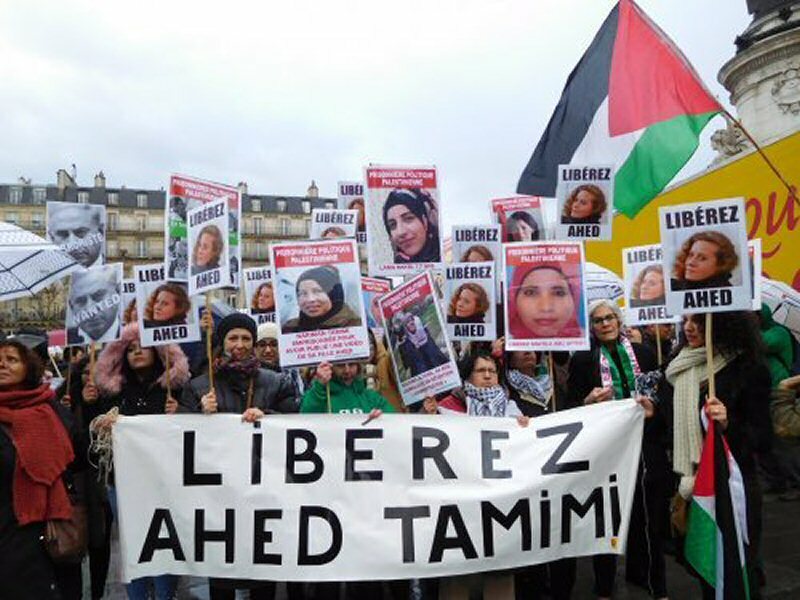 Joining in the large International Women’s Day demonstration, protesters marched from Republique to Opera led by a banner urging freedom for 17-year-old Palestinian prisoner Ahed Tamimi. Carrying photos of Ahed and many imprisoned Palestinian women and girls, including Shatila Abu Ayyad, Amal Taqatqa, Marah Bakir, Khalida Jarrar, Lama Bakri, Manar Shwaiki, Nariman Tamimi, Shorouq Dwayyat and others, the marchers chanted for Palestine and to build the boycott of Israel throughout the route of the march. 03/22/18 Occupation Captured: Photos of Palestinian Life and Israeli Occupation in the West Bank City of Hebron.